Today the Gyalwang Karmapa launched the 5th Khoryug Conference on Environmental Protection for Tibetan Buddhist Monasteries and Nunneries in the Himalayas. Khoryug, which means ‘environment’ in Tibetan, is a network of Tibetan Buddhist monasteries and nunneries working under the guidance of the Gyalwang Karmapa, and in association with the World Wildlife Fund Sacred Earth program, to protect the fragile Himalayan environment. Around 60 monks and nuns representing 50 Himalayan monasteries and nunneries in India, Nepal and Bhutan are participating in the five-day Khoryug Conference at the India International Centre, with theme of ‘Conservation of Freshwater Resources in the Himalayas.’ Throughout the week the monastics will be educated on all the various aspects of water systems and their preservation, ready to return as environmental leaders to their respective communities. On his arrival at the conference the Gyalwang Karmapa first lit the customary lamp, and then made a special water-bowl offering before a statue of the Buddha – a reflection of both the scientific theme of the conference, as well as the spiritual inspiration behind it. The Chief Guest at the opening session, Shri Jairam Ramesh, who is the Honorable Union Minister of Rural Development and former Union Minister of Environment and Forests, also addressed those gathered. Throughout the first day of the conference a range of distinguished speakers delivered sessions on the freshwater theme, including: Tenzin Norbu, Director of the Environment & Development Desk at the Central Tibetan Administration; Dr Dipankar Ghose, WWF India; Dr Suresh Rohilla, Centre of Science and Environment; Dr Sarala Khaling, Regional Director at Ashoka Trust for Research in Ecology and the Environment; and Dekila Chungyalpa, Director of the Sacred Earth program at the World Wildlife Fund USA, who is also moderating the conference. Reflecting the diversity among participants, sessions were delivered in a combination of English, Tibetan, Hindi and Nepali languages, while topics covered on the first day included the water cycle, ecosystems, biodiversity, and food webs. During the afternoon session the monks and nuns broke into small working groups of 4-5 people, where they explored the water resources and water situation in their own monasteries and nunneries. The Gyalwang Karmapa is well-known for his keen interest and strong commitment to environmental protection. 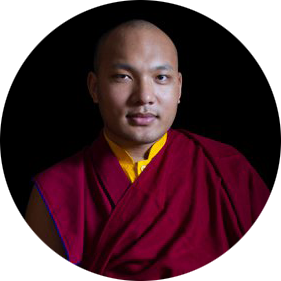 By skillfully using the great respect that is accorded to him as a spiritual leader throughout the Himalayan region, the Gyalwang Karmapa is uniquely placed to provide inspiration, motivation, and enlightened leadership amongst local communities in protecting the fragile Himalayan environment. 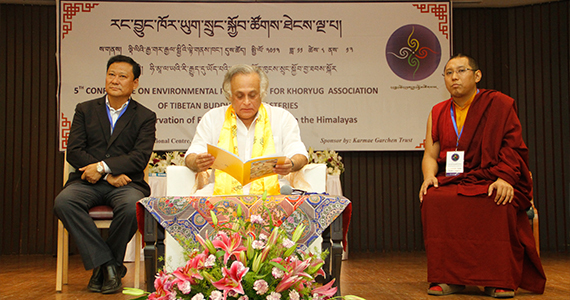 In his role as chair of Khoryug, and through the initiatives developed during the annual Khoryug Conference, the Gyalwang Karmapa’s environmental influence extends throughout the Himalayas.